The ferocious surf crashing into Northern California's coast has had deadly consequences for three people in less than a month and numerous close calls for others. First responders as result of the dangerous surf are issuing a warning ahead of the three-day weekend. 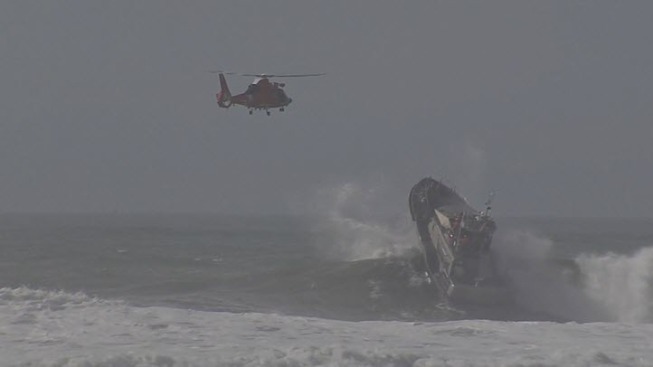 In San Francisco's Ocean Beach, crews on Friday held a rescue demonstration against the powerful backdrop of this winter's stormy north Pacific. "We've had folks swept out who are young, old, championship swimmers and surfers," United States Coast Guard Capt. Greg Stump said. Eight people have been swept out to sea since El Nino conditions began -- from Santa Cruz to Pacifica to the rocks off Land's End in San Franciso and Marin. Five of the people were rescued in time, but just barely. Still, it has let to three drownings in less than a month. "We realized that when we got those numbers so close together, people are not aware of the conditions," said Rudy Castellanos, assistant deputy chief for the San Francisco Fire Department. During Friday's mock rescue, the swift current carried a stranded swimmer more than 50 yards in a minute, which became a valuable lesson to two young girls who watched the demonstration. "The waves are huge and the way that swimmer was carried away was crazy," Mia Torres said.